It's been a busy week with my son and I both sharing a birthday - we celebrated with a weekend away with family and friends, lots of wine and even more food. I'm amazed I didn't have to be rolled out of there! As soon as I saw the diamond I knew exactly which stamp set I'd use - Lovely Layers from PTI. I used Glimmer Mist to create the soft, stencilled background and the sentiment is Winnie and Walter. There's a whole heap of inky inspiration from the FMS Design Team so make sure you check out there cards and pop by won't you? Oh that layered flower is fabulous! 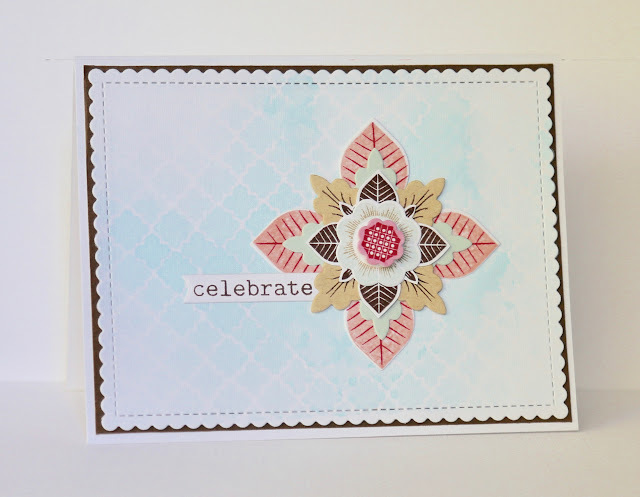 Love your soft background and scalloped edge too! Thanks for making my sketch look wonderful! WOWZA, this is fabulous! What a great element, love the colors and layers! Saw this over at FMS and had to come by and say how fabulous it is! Well done!! A total WOW card! I love all of the detail and color on that gorgeous flower. Happy Belated Birthday to you! My younger daughter and I both share a birthday too. Oh wow! What a totally gorgeous card! Your flower is not only stunning, it's super creative and so eye-catching - I'm in love! These stamps are perfect for this sketch! Gorgeous card! What a beautiful card Claire! I love that flower! It's just gorgeous! Those layers are perfect! The background is amazing too! Happy Belated Birthday!!! Claire this beauty inspired me to play this week! I just love the sweet simplicity, yet such a detailed lovely image! Love the colors, too. I have always been wanting this set, and you may have just pushed me over the edge :)! Happy Belated St. Patrick's Day ;)! This image is seriously perfect for the sketch! I love this amazing card!! Happy birthday (a little bit late)!! Layered perfection! Love these colors!